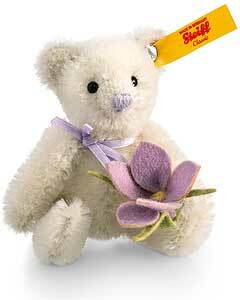 Crocus Mini Teddy Bear by Steiff is hand made in beautiful white mohair and holds a wool felt made Crocus flower. This lovely Teddy Bear wears a narrow lilac ribbon aound her neck which matches her lilac hand stitched sewn nose. Carries the Steiff Button in Ear and yellow ear tag.